As discussed in class, most things are placed into categories or concepts. I am a preschool teacher and I see just how difficult it can be to place items into categories through the eyes of a two year old. Many books and online tools are available to help children learn the skills to place objects into categories. The main way I teach my students how to organize items is by beginning when they are cleaning up. The two year old students in my class are able to identify all of the animals and place them in the animal bucket or put all the blocks into the block bin. What I find the most interesting and a subject that raised a question was if children at the age of two can categorize toys by type, why are they unable to place all the squares with the squares and circles with the circles? Below is the answer I received once I researched more into the question. “Like all other math skills, sorting and patterning skills are developed in a sequential manner.Children begin by comparing objects and matching like items. Then they learn to categorize, which is sorting. They typically start with sorting by color, then moving on to sort by type.Next comes classifying. 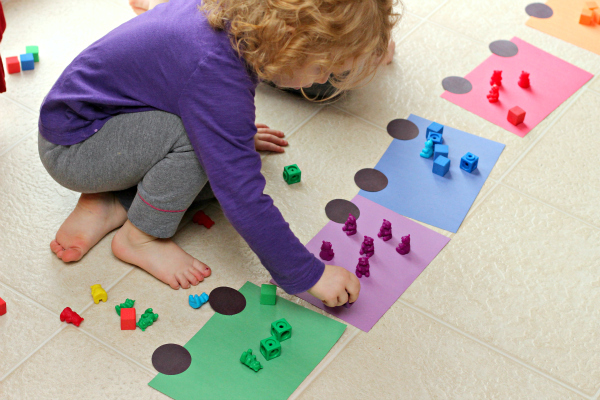 When learning to classify, children first learn how to classify by naming attributes that allow items to fit within a group, then move on to identifying attributes that exclude from a group.By having a foundation in sorting, children can then move on to the recognizing and creating of patterns, another way to organize. By the end of kindergarten, children should be able to recognize and produce different kinds of simple patterns, such as AB, AAB, and ABC patterns”. Based off this explanation, I am providing the building blocks for the children to understand schemas and they will be able to categorize by shape and color once they have an understanding of different exemplars for different concepts. Once children are primed they will be able to make the connections, for example, that all the red circles go with all the other red circles. So my job as a teacher, is to give them the tools to be able to make those connections once their brain has the ability to do so. This entry was posted in Uncategorized on April 1, 2018 by abeasley. The way children’s minds work and learn about the world around them is so fascinating! I am so happy you chose this topic because my significant other is studying education and recently did a project on how music and rhythm can also help children learn categories and patterns. It’s so interesting how something we see as simple, like sorting toys in bins and clapping a given rhythm, is something that needs to be taught explicitly at a young age. Very interesting!